At GLS Group, we specialize in helping employers and companies engage with their customers in order to retain them, attract new customers, and grow sales. A very common way many companies do this is with discounts. While there are many benefits of discounts, there are also multiple drawbacks. Discounts seem to be a quick and easy fix that companies can use to attract a crowd. They are often used to entice new clients, for engagement, retention, to win back an old client, or to increase sales. However, there are a lot of pitfalls in using discounts. After so many discounts or coupons from the same company, the customers begin to expect them rather than think of them as a special treat. After a while, how often will these customers go shopping at this store without the coupon? Especially when they know that if they hold out a few days, there will be a new coupon in the mail. Moreover, discounts will devalue the product or service of that company. Once your customers have paid a low price, they will always want that price. Therefore, it is easy to decrease your prices but much harder to increase back to the regular amount. Discounts also signal a lack of confidence in your product or service. Customers may feel that you are lowering your prices because they are not worth their full value. A great alternative to a discount is a client loyalty program. 71% of consumers who are members of loyalty programs say membership is a meaningful part of their relationship with the brand. 70% of consumers say they're more likely to recommend a brand with a good loyalty program. After all, recommendations are the best way to get new business. 27% of consumers are more likely to modify their spending habits if a brand's loyalty program establishes an emotional connection. These statistics show that customers feel more connected to companies who offer loyalty programs. This makes them less likely to shop with their competitors! 63% of consumers say they modify their spending habits to maximize their loyalty program benefits. So, customers will adjust their budgets and their spending to maximize their loyalty program benefits. Which, in turn, creates more frequent and better business for your company! 60% of consumers don't want to share their information in exchange for a discount. That means discounts are not that much of an incentive to purchase. Whereas, people do share their information for loyalty programs. 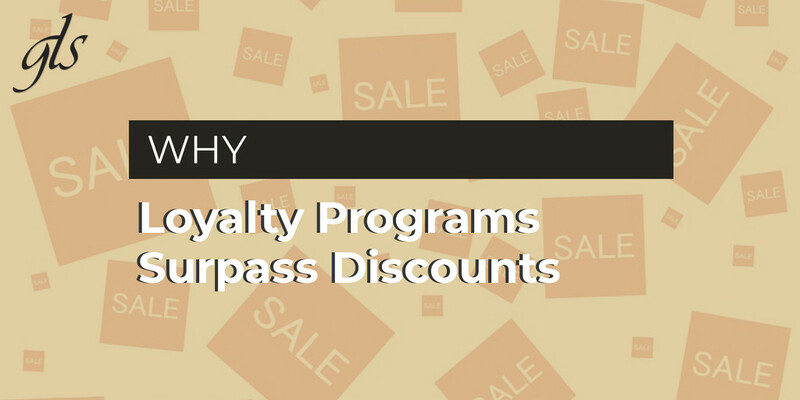 The numbers don't lie, discounts are not effective, but loyalty programs are! At GLS Group, we create custom loyalty programs for many different types of clients. If you have any questions about creating a customized loyalty program for your business, contact us today!